Happy new year. I hope 2017 treats you well. 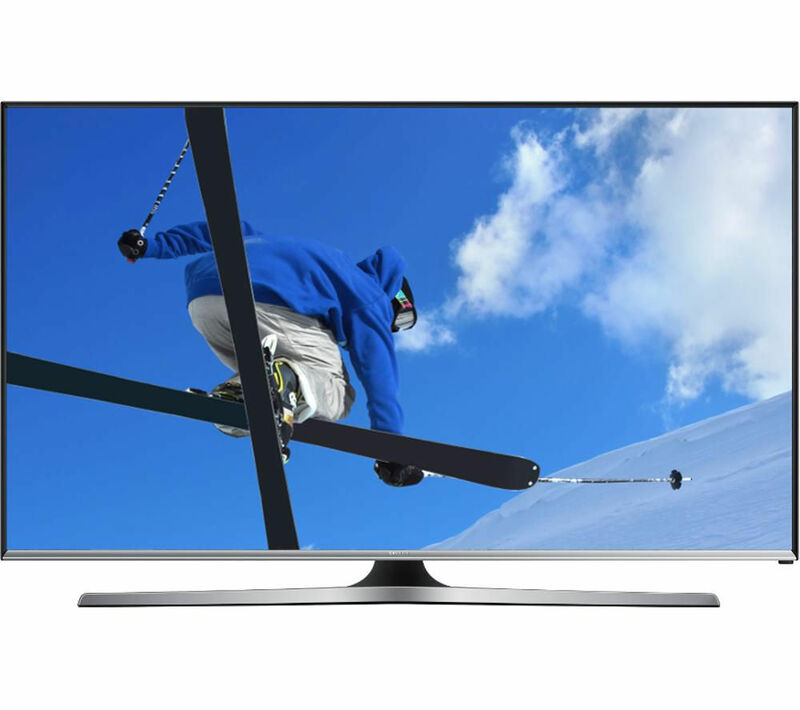 Did you get any money for christmas and thinking of buying a new TV or other electrical item, then head on over to Currys.co.uk where you will pick up some great deals. Currently they have up to 50% discount for both online and in store purchases. This sale may not last long so you will have to be quick. A friend of mine told me that he brought a Samsung 40 inch TV for just £279.99. This is a superb price for such a good decent Television. Perfect for that games room or 2nd lounge. It looks pretty decent and he is happy with it. Here is the TV, not bad for less than 200 quid hey! After being frugal for many years, I’ve decided that I don’t treat myself enough, so I went out and brought me a brand new BMW 4 series. I had my eye on this motor for several months and my wife’s car finance was up for renewal. So we both agreed we would trade her older car in for my new beemer. So I’ve traded in a Nissan Qashqai family car for a 2 door coupe! mid life crisis or what! Being a Frugal Dad has helped me to manage my money and allow me the luxury to buy a new car. Also having several websites which bring in additional income every month also helps. 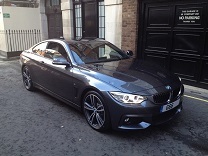 In fact the upgrade from the Qashqai to the BMW hasn’t cost much more on our monthly payments. I could have some savings to buy the car but decided with interest rates being so low I would use the car finance so that we have savings for a rainy day. I’m now on the hunt for some upgrades for my car. I want to make my car look unique so that it’s not entirely the same as every other car on the road. Some people will think I’m crazy to spend so much money on a car, but this is one of my passions. So I plan to get a new rear bumper, called a diffuser, some black kidney grills and a 2nd set of bmw alloy wheels from alloywheelfinder.com for the winter. Here is a picture of my new car. Hope you like it! Recently we returned from our family holiday in Tenerife. It was such a good week, relaxing, spending quality time with the wife and kids and to completely switch off from every day issues. We stayed in a place called Costa Adeje, next to the popular Playa De Las Americas but far enough away to avoid the chavs and also since we aren’t on a 18-30s lads holiday. We decided to go back to a hotel we have stayed at before since we had a great time last year in the same hotel/resort. We found the best price was to book direct with the hotel. The hotel was rated 5 star and the kids had a great time in the pool last year, however this year was a bit of a let-down, since the hotel manager has changed, the children weren’t allowed floats in the pool. Apart from a few issues with the hotel, we still had a great time. Would we recommend someone to stay here? Probably for the money it’s pretty reasonable. However we’d prefer to pay that little extra and stay somewhere different next time. We did however love the resort and would definitely go back. We flew with Monarch Airlines. We shopped around and used a website (which I’m sure you’ve heard of on the TV) called Trivago to help find the cheapest flights. We paid about £1200 for 2 adults and 2 children for our flights. This was fairly cheap considering it was kids school holidays. The flights were ok, but the seats not that comfortable. No leg room, but we coped for the 4 hour flight and soon forgot about it once we got to the resort. 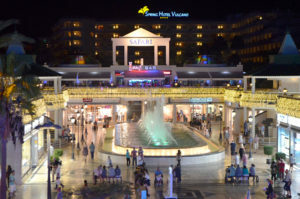 Costa Adeje has 2 parts to it, the nice part with some fancy restaurants, a little more expensive eating out that say at home. About £60-70 for a evening meal with drinks for 4 people. This ‘posh’ part was near to the Del Duque beach. The other part had a bit of a Blackpool feel to it with for us wouldn’t be our choice of a Spanish holiday resort. However they do also have nice restaurants and lots of things to do for the kids (trampolines, crazy golf, nice beach etc.). 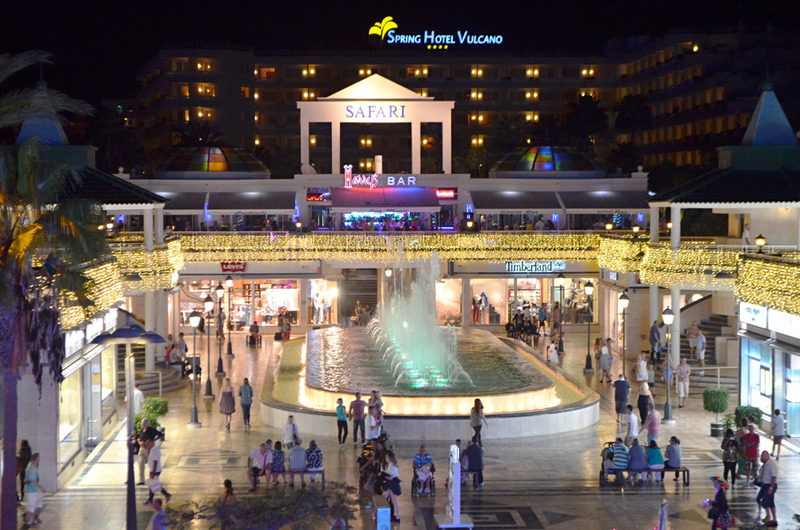 We ended up getting a taxi a few times to a place called Safari Centre in Las Americas of all places. I tell you what, since I last went to Tenerife in my twenties, this place has changed massively. The safaris centre has several restaurants and you will be spoilt for choice. They had a Tex-mex, an Italian, a Steak House, & a Thai restaurant. We tried several of these restaurants out and enjoyed the food in all of these, with very friendly staff, good service and a great atmosphere. From Adeje to the Safari Centre, a taxi would cost about 12 Euros, but well worth it. 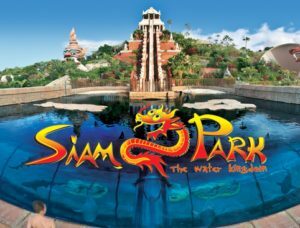 We also took the kids to Siam Park for the day. This is the best water park in Tenerife, if not the best we’ve been to before. The only issue we had was having to queue up to get in the park and to get your locker. Once you’ve found the beach as a base, you can explore the water park. Loads of fun water slides, rapids, wave machine for all the family to enjoy. We will return to Tenerife for our family holiday in the next couple of years. We have some other places in the world to explore first. If you are like me, you tend to play golf when the weather is nice. I’m a seasonal Golfer and if I’m lucky I’ll play more than a few times a year. It is difficult with a young family trying to find the time since a day out at the Golf course is exactly that… a day out. It takes up so much time. Getting around 19 holes (18 on the golf course and the 19th in the clubhouse) can take a good 4-5 hours. I recently was looking for a new set of clubs and as I don’t play that often I didn’t want to fork out loads on a brand new set. Golf sets can be very expensive, so I found this neat site which sells both new and used golf clubs for sale online at discount prices here. They have a huge selection and I must have spent a couple of hours browsing through every possible golf model available as their was just so much choice. I’ve now put it on my birthday list and will see if I’m lucky enough to get them! I opted for a used set of Nike Clubs. I didn’t go with Ping since they are mostly custom fit to you, and a bit more expensive. I also liked Titleist but thought Nike suited me best because I am a bit of an amateur golfer! Before now I’ve been using a 2nd hand set that I brought off my brother in law about 10 years ago. They’ve lasted me very well and before that I had my Dad’s old clubs. You can safely say I don’t mind having peoples left overs! 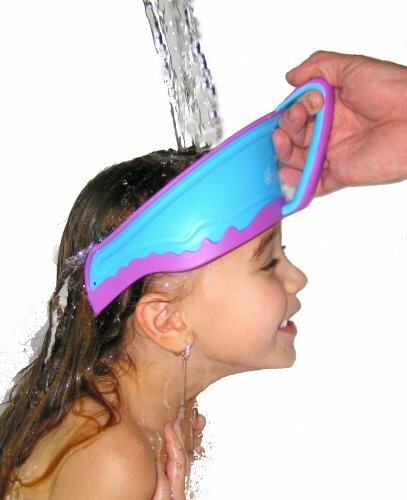 I just found this Genius idea of a product that solves a common problem in my household and I’m sure it will help other parents who have children that moan about having their hair washed. It’s called the Splash Guard. It looks a little like a pretty dustpan that fits around the forehead of your child. Apparently you need to make sure to hold it in a downward angle and not like a baseball cap as someone in the Amazon reviews stated! I’m sure my wife will purchase one of these as soon as she reads this blog post! Maybe I should have kept quiet so she doesn’t spend any more money. Although this will benefit us as a family as the kids will no longer winge and it will help speed up shower times. Being a Parent is not an easy task most of the time. We always want to make sure they are cared for and looked after. I’m sure most parents at some point or another have lost there child because they have run off somewhere whether it be in a big shop or at some busy place like legoland! You will be going out of your mind trying to find them. I found this great DIY tip on another blog so can’t take credit for the idea but wanted to share it on here. 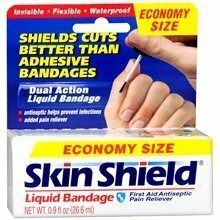 Basically you write ‘if lost call’ and your mobile number on your childs arm, then put the liquid bandaid on top, wait for it to dry and now you have yourself a temporary tattoo that is also water proof. This should last about a day. Payday Loans can be a life saver for some people and for others can turn into a nightmare. It’s about how and when to use them. Usually it’s a last resort to turn to payday loans when money is running tight and you have no other means. This blog is mainly about money saving, but I think it would also be a good idea to share my view point on the lending side in case there are people out there who are cash strapped, who might be reading this blog and are unsure whether to use a payday loan to help them or not. I’m sure by now you’ve all heard about payday loans; we’ve seen the adverts everywhere and maybe thought to yourself, why anyone would want to take out one of those when they have such huge interest rates!! I agree with you until you start to think about the situation people might be in, with no other options available to them. Often people will need access to money ASAP and are not able to get the cash they need quickly. Payday loans are flexible and offer loans in 15 minutes in most cases. Some reasons why they would need cash so quickly could be to pay for things like boiler breakdown, emergency car repairs, got rent to pay and simply cannot afford it this month. The high interest rates can put you off even thinking about applying for a cash loan online. Some lenders charging as high as 4000% APR. It does seem ridiculous. You have to remember that this is the rate per annum. You will only ever take out a loan for up to 1 month, so the charges will be pro-rated. It’s often best to look at the amount of interest charges you will end up paying back. As long as you feel comfortable with this and feel you can pay this back next month then it could be the solution for you. However if can turn into your worst enemy if you aren’t able to pay it back because the interest will creep up on you. These loans are so easily accessible that it can be so easy cause you to spiral into debt. Much like credit cards can be. So why not get a credit card then. This is certainly a better option in some cases providing you can wait up to a couple of weeks. It can take a while to apply and also seems to take a long time before you get accepted and are able to use the card. You can also use your overdraft facility if you have one but make sure to check the charges. Some banks charge daily fees so this can often work out more expensive that what a payday loan works out to cost you. It’s just that banks do not show the interest amount on these fees as they are fixed. Getting a credit card or using your overdraft facility can be alternate solutions, however not always readily available to everyone. Usually you have to have a good track record and a good credit score. Maybe you are currently not employed and are unable to borrow off your family, so the only option is loans for the unemployed. So if you find yourself struggling with no alternative, then a payday loan could be the only solution for you. Just remember to pay it back as quickly as possible. Consider cancelling your subscriptions to those ‘luxury items’ and also maybe eat beans on toast for a while. Take back any recent clothes you may have brought, consider walking to places instead of using the car. Do all you can to cut back until your finances are sorted. The Internet has revolutionised our lives. Using the world wide web you can book a holiday, buy shoes or even make a whole new virtual life, if you have a mind to. The Internet has also changed the way we can earn and is a gateway to a world of money making schemes. From being able to sell samsung galaxy s, to selling your talents or even flogging your old clothes, there are a variety of easy and quick ways to earn extra money. It may not sound like a particularly inspiring way of making money, but clearing your house of clutter can actually help you to earn some quick money. In amongst all the broken toys and torn clothes, you might actually find a few things of value. Anything that you have that you think might be worth a bit you can list on online auction sites. It’s very simple to put your things up on sites like ebay and the cost is minimal. Vintage clothing sells particularly well, as do old records. However, if you find any electronics that you want to sell, it’s a good idea to try specialist sites, where you’ll probably find a better deal. If you’re selling an old phone then the best place to try is on an online phone recycling scheme, which can pay out a fair amount depending on the age and condition of your model. In general, filling out a questionnaire form is fairly dull and not something that you’d do by choice. However, the internet has turned even this prosaic pastime into a potential money maker. Paid questionnaire sites include ipsosinteractive.com, swagbucks.com and onepoll.com. Once you register with one of these sites you’ll start to get questionnaires in your email inbox. Although the money isn’t great, if you spend a lot of your free time diligently filling in the questionnaires you get sent you could stand to earn several hundred pounds a year, either in money or in vouchers. The current economic climate is making it harder and harder for people to find work; this is especially true for those without experience, such as those fresh out of university. However, in some professions such as graphic design and copywriting, the internet has made it easy to forge a career path on your own. Sites like peopleperhour.com, gofreelance.com and guru.com are designed to make working for yourself easy. After setting up an account with one of these sites, you’ll become part of an online database that allows you to advertise yourself to would-be employers. If you lack experience you can make yourself more attractive to potential employers by reducing the hourly rate that you would be willing to work for. Once you’ve found a bit of work, finding more becomes easy, so you can sit back, relax and wait for employers to find you. Family holidays are supposed to be a time for relaxation and enjoyment as you experience new surroundings in the company of the people that you care about the most. However, a break with the family doesn’t always turn out the way that you imagine: busy schedules, the dangers of unfamiliar environments and unruly kids can cause your meticulously planned holiday to unravel. To help ensure that your family holiday runs as smoothly and as safely as possible, try these useful hints and tips. To cut the cost of your family holiday, booking the break as early as possible is a great idea. If you’re flying to your destination of choice, you can book as early as 9 months in advance, when the cheapest seats are still available. If you’re travelling by bus or train, you can save a lot by booking just a few months in advance. As well as saving your bank account, booking early offers several other advantages. With you travel arrangements out of the way you can focus your energy on preparing for your break. The first place to start is with insurance, which is vital if you’re going away with children. Kids can be particularly vulnerable to things like food poisoning, so make sure you’ve got adequate cover in the case that you have to make holiday illness claims. Of course, prevention is better than the cure, and you can reduce the risk of having to make a claim for holiday accident compensation by doing a bit of research on the area that you’re going to. If you intend to eat out when you’re away, try to learn about a few well recommended restaurants. You should also learn about the things you can do there and, just as importantly, the things that are prohibited, as well as any immediate dangers. You should also check up on the weather conditions of the area and any necessary equipment that you’ll need when you’re away. For instance, you might need armbands if you’re taking your kids to an area by the sea or if you’re hotel has a pool. If the weather is particularly warm, then make sure you stock up on sun cream. It’s a good idea to buy these things off season, when the prices will be considerably lower than during the holiday period. It’s a good idea to check up on local customs and tourist attractions. However, while it’s important to keep children occupied, don’t overload the schedule. It could become difficult to stick to which can be disappointing. Moreover, some of the most enjoyable times you can have are those that are unplanned, so leave plenty of free time for you and your children to go and explore the local area. When you arrive in your holiday destination, it can be a little disorientating, however, it’s vital not to forget the basics: keep your children supervised at all times and remember to keep yourself and the kids hydrated, especially in an area with a warm climate. Taking your kids on holiday can be a bit stressful, but you shouldn’t let that put you off from taking a break with them, after all, there’s nothing more enjoyable than keeping your little ones safe. I wanted to share with my readers this interesting story that impressed me the other day. I was speaking to my Mum the other night on the phone (she lives about 180 miles away from me unfortunately) and she was telling me about her recent eBay antics. She only started using a computer recently and has been doing some eBaying for a short while. She gets my Dad to take the pictures and help post the items for sale. Recently she brought a designer handbag for only £15 off another eBay seller. She brought the item as she knew that if she didn’t sell it that she’d be happy to keep it. Think of her as the Imelda Marcos of handbags!! She had already owned a similar designer handbag before and had kept the labels. The handbag that she brought looked brand new but didn’t have the labels. She then decided to list it for sale, choosing to do this on the Free listing weekend so she didn’t have to pay any listing fees. She set the starting price at £29 thinking at least she would get her money back and profit if it sold. Bidding started and it went for nearly £70. I know its not a massive amount but over 4 times her initial investment with a little bit of her time. Lord Sugar would be proud! Well if he’s not I know I am. My mum has taught me a lot in life and she still keeps on impressing me to this day. In the past she has saved up her eBay profits and used it on the grandchildren which is lovely and we thank her for it. We only hopes she treats herself too! © 2019 FrugalDaddy.co.uk - All Rights Reserved.